I have a super short attention span for music. Most usually just annoys me. I memorize and can recall most commercial jingles (even though I don’t like music). I don’t do it on purpose. I once rode the tram in the Detroit airport with Kevin Bacon. I was too freaked out to say anything to him, though. I was surprised I had that reaction around a celebrity. I started out in college as a pre-med major (then switched to art in my 2nd year). I kind of wished I’d trained to be a medical illustrator. I don’t like any dark colored pop (soda) - coke, pepsi, root beer, etc. = yuck. My husband and I went to school together from 5th-10th grade. He left to go to a different school and I didn’t see him for 15 years even though we lived in the same small town. Then, we were matched on eHarmony…and the rest is history! I’m a true introvert in that I need alone time to recharge. Being around people definitely zaps my energy. I also rarely feel the need to leave my house. Ha ha. I have visited England, Italy, Greece, Singapore, Japan (only in the airport on a layover), Mexico and Canada. I would love to travel to France and Turkey someday! I have 3 kids ages 11, 8 and 3. 1) What is your passion in life? Other than faith and family, it's definitely art. I read about art, think about art and do art as often as I can! 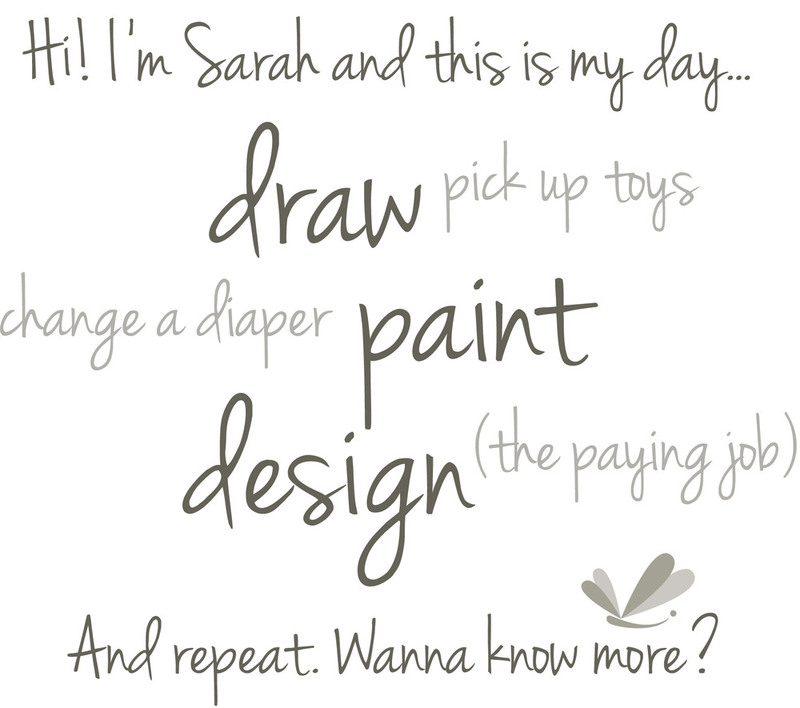 I knew I wanted to create an art blog, but I also thought about it as "drawing myself out" so it became drawingsarah. I wanted to make art on a more consistent basis and I figured a blog would help keep me accountable. 4) How do you organize your blogging schedule? My goal has always been to draw and paint everyday but I try to blog once a week. So I really don't have a schedule even though I know I should. 5) If you could meet anyone in the world, who would it be? This feels shallow and I'll probably think of someone more meaningful after I publish this post, but I'd love to meet the actress, Kate Winslet. 6) What do you hope to accomplish in 2015? I really hope to open an etsy shop and make a sale! 7) Name three characteristics that best describe yourself. 9) Who do you admire the most? Rather than choosing one person, I'm going to say I admire those most who have integrity, who are the same behind closed doors as they are in public. *See Random Things about Me #1 - ha ha. Anyway, probably Yesterday by The Beatles. When did you first know you had a talent for art? Do you ever fear the blank page? How do you overcome that fear? What is a goal for 2015? What is the most challenging thing about the art you make? Describe a typical day. Do you keep a schedule? Coffee or tea? What is your favorite drink? What is the best art advice/tip you've ever received? Are you a self-taught artist or did you go to art school? Where? For self-taught, did you read books, take online classes, etc? What is your favorite social media? Facebook? Twitter? Instagram? Any others? Ladies, I can't wait to read your answers to these questions! I checked out all the blogs and there is so much beautiful work to drool over! Thanks again, Jennifer, for nominating me. This was fun!